We study the problem of jamming in multiple independent Gaussian channels as a zero-sum game. 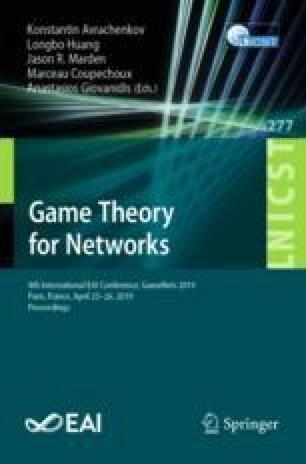 We show that in the unique Nash equilibrium of the game the best-response strategy of the transmitter is the waterfilling to the sum of the jamming and the noise power in each channel and the best-response strategy of the jammer is the waterfilling only to the noise power. The research leading to these results has partially received funding from the Marie Sklodowska-Curie Actions - Initial Training Networks (ITN) European Industrial Doctorates (EID) project WiVi-2020 (H2020 MSCA-ITN, project no. 642743). For this work the first author is supported by the Stavros Niarchos Foundation-FORTH post-doc fellowship for the project ARCHERS.